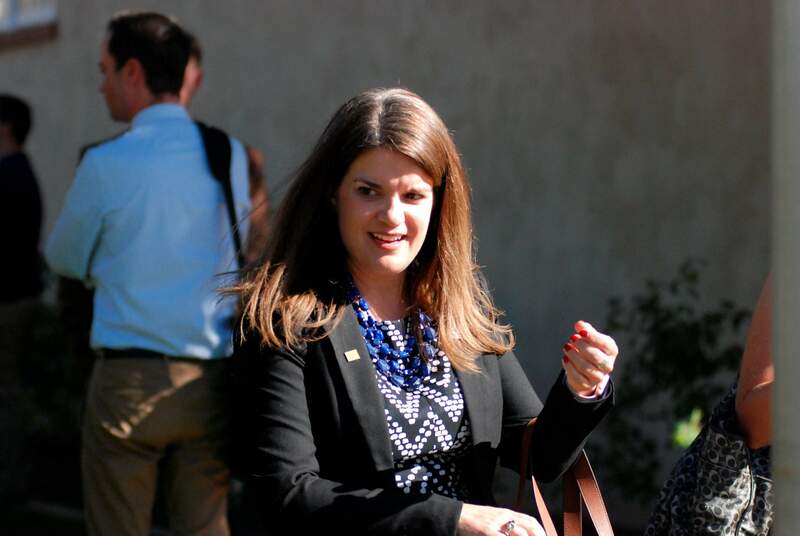 New Mexico Secretary of State Maggie Toulouse Oliver leaves a courthouse in Santa Fe on Wednesday, where the state Supreme Court ruled against her efforts to reinstate a straight-party voting option on the November ballot. The option would have allowed voters in New Mexico to select candidates from a particular party in all races by marking a single ballot box. Critics say that would have harmed independent, minor-party and Republican candidates in a state dominated by registered Democrats. SANTA FE – The New Mexico Supreme Court on Wednesday blocked a ballot option that would have allowed voters to select candidates from a particular party in all races by marking a single box, bolstering the retreat of straight-party voting options nationwide. In a unanimous decision, the court found that Secretary of State Maggie Toulouse Oliver – an elected Democrat – did not have authority to reinstate straight-ticket voting after it was dropped from statewide ballots by a Republican predecessor in 2011. The court sided with critics who argued that it was up to the Legislature to make a determination about straight-ticket voting. The practice in New Mexico dates back at least a century, but Chief Justice Judith Nakamura noted that lawmakers have wavered repeatedly in recent years on whether to clearly prohibit or authorize it. “Did the Legislature intend to delegate its discretionary authority over straight-party voting to the secretary of state? It clearly did not,” Nakamura said in announcing the opinion. Just nine states allow the voting option, according to the National Conference of State Legislatures. Several states have abolished it since the 1990s. Most recently, Texas adopted legislation against straight-party voting that takes effect in 2020. “The trend is going the other direction – it is not requiring straight-party voting,” said attorney Christopher Saucedo on Wednesday, urging justices to block the quick-check ballot option. Toulouse Oliver had billed the change as a way to make voting more accessible. The move drew immediate criticism from the Republican Party of New Mexico, Libertarians, advocates for independent candidates and even some Democrats who described it as partisan maneuvering. Democrats dominate registration rolls in New Mexico, accounting for 46 percent of eligible voters statewide. Republicans account for 30 percent. Expressing disappointment at the ruling, Toulouse Oliver said her office would abide by the decision and look for other ways to encourage voter participation in the future. She is seeking re-election in November against Republican college professor Gavin Clarkson. Justices voiced skepticism about arguments in favor of automated one-party voting as a tool to speed up balloting, encourage turnout among weary voters and increase participation in down-ballot races. Justice Charles Daniels pointed out that voters can find party affiliations next to each candidate on the ballot to inform their decisions. “It’s not as if a party affiliation at this point is being hidden,” he said.